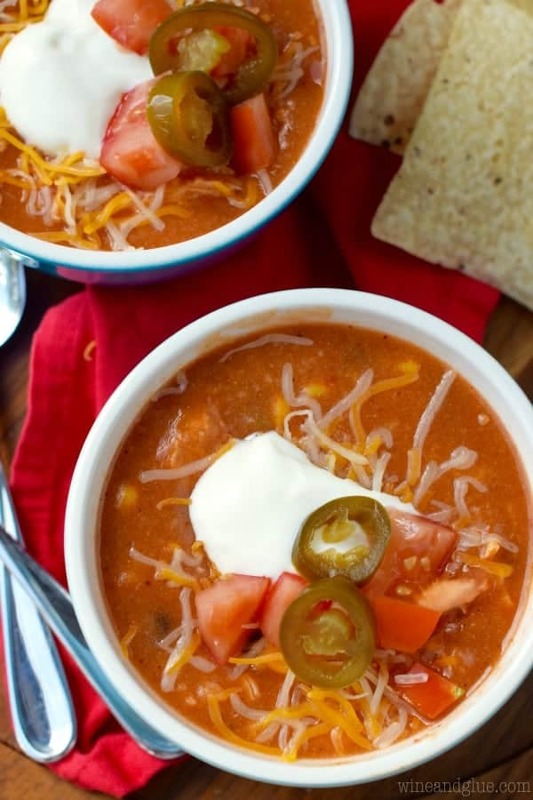 This Slow Cooker Chicken Enchilada Soup is easy to throw together with amazing flavor and only about 300 calories a bowl! It will quickly become a regular on your family’s menu. Thank you Horizon Organic for partnering with me on this amazing dinner! Do you ever stop and wonder why it is that planning dinners is so hard for everyone. I mean really. I know so many moms – working and stay at home . 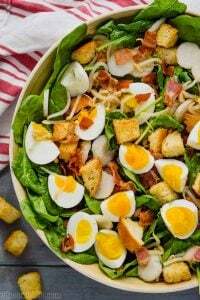 . . and a lot who work from home – and they all complain about how hard it is to put a good, healthy, easy meal on the table at the most stressful time of day when everyone has just kind of had it for the day. Wait. I think I just answered my own question. Everyone wants it. 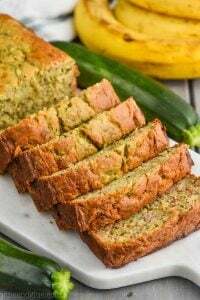 A meal that is healthy, easy to make, and good for you and it has to happen at the time of day when homework is getting done, we’re getting kids to and from activities, and the little ones are hanging on by a thread as you get alarmingly close to their bedtimes. The answer for me is often one of two things: soup or the slow cooker. Better yet? Soup in the slow cooker. You throw things together earlier in the day when you aren’t ready to pull your hair out and then just when it’s all about to hit the fan, you open up the slow cooker, let out the most amazing smells and call everyone to the table. The other thing I love about soup is that you can cram all all the major food groups into one pot. 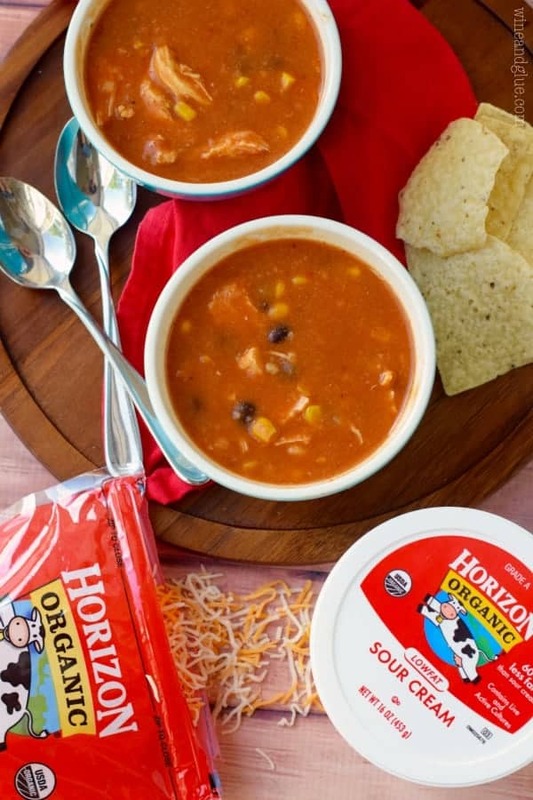 A carb, a veggie (or two if you’re lucky), a protein, and in this soup some low fat organic dairy with the help of Horizon Organic. Why does adding dairy to a soup make it 10 million times better?? It’s like taking something good and making it insanely delicious. We love using Horizon products, my kids are almost half made up of their mac ‘n cheese. 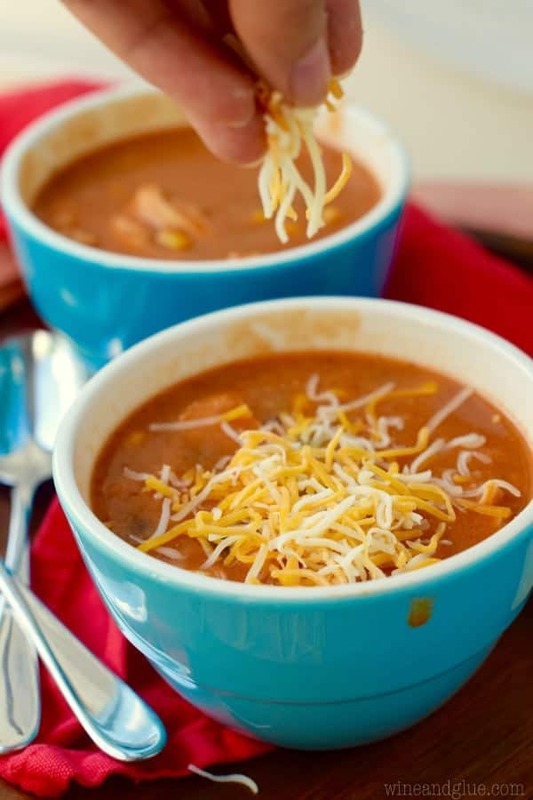 And their cream is the perfect addition to this soup or this one (<—– a family favorite!). 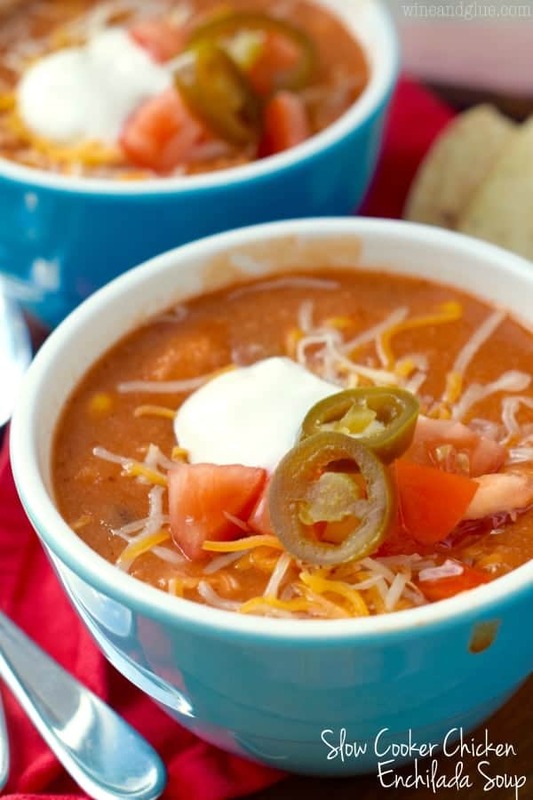 This Crock Pot Chicken Enchilada Soup is definitely bound for fame in my family. It was the first soup that I didn’t strain for my kids. They are little weirdos (apple doesn’t fall from the tree) and can’t handle anything “saucy.” But the base of this soup is too good to be missed, so I gave them a big bowl full topped with cheese and they devoured it . . . . and then Quinn just sat and ate an entire pile of Horizon shredded cheese . . . .
And Nathan, who is never very good at throwing meal compliments my way told me that it was “a little too good” before he went for another bowl. (#WIN) And I told him no worries because it’s only about 300 calories a bowl. And with a little Horizon sour cream and cheese? Still less than 400! Amazing, right?? Now that is what I call a smart dinner win. Make sure you follow Horizon on Twitter, Facebook, Pinterest, and Instagram for more smart dinner ideas! Whisk the chicken stock and masa harina together. Combine this and all the rest of the ingredients (except the toppings) in a large slow cooker . Cook on high for 3 to 4 hours or low for 6 to 8. Remove the chicken from low cooker, shred, and return to the slow cooker. Serve topped with sour cream, cheese, diced tomatoes, and jalapeños. I use chicken stock base which is made into chicken stock by boiling water and adding the base. This was really helpful in this recipe because it made it really easy to add the corn flour by having the chicken stock hot. Oh how I love a good slow cooker recipe! Perfect for this time of year! I’m soooo in that Mom category! The stress of making dinner during the week is terrible. Love this soup! You and me both, lady! Thanks! To save on carbs, how would it be to leave out the corn flour? It would totally be fine Sheila, BUT! The corn flour gives it a wonderful taste and creaminess that I think it is totally worth it. I use chicken breast, throw it in with everything else raw and then when the soup is done pull it out, shred it and throw it back in. I’m so gla you like it Rachelle! Love your recipes! What size slow cooker do you use for your recipes? 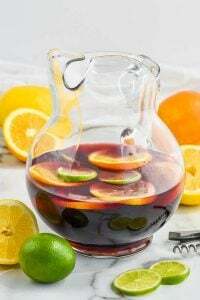 I have a small 1.5qt and was wondering if this recipe would work for me? If not how can I downsize the recipe to fit my slow cooker? Thanks! Hi Jessica! I’m so glad you like my recipes! So, I have a 6 1/2 quart slow cooker. Usually my recipes take up about half the slow cooker. I’m wondering if you cut the recipes in half if they would work in your slow cooker. I have no idea how long they would take though. If you give one a go, let me know how it works out. Can I use instant corn flour in place of regular corn flour? 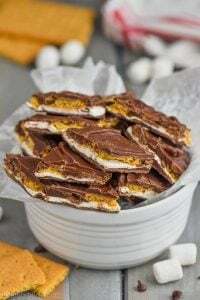 I love this recipe by the way and so does my family! I’m so happy you guys liked it! I haven’t tried it with that, but if you do, let me know how it goes!